The UK manufacturer exceeded the amount of ceiling tiles it recycles at the bi-annual show, this year recycling 14,769m2, compared to 13,400m2 in 2014. It is also the first time Armstrong employed its Off-Cut scheme, in addition to its End-of-Life scheme. The company has also announced that the amount of mineral ceilings recycled from more than 200 temporary corporate hospitality and business chalets and exhibition halls on site rose from 61% in 2014 to 79.8% this year. Some 1,885m2 (or 12.7%) of this year’s recycling total was from 70 bags of ceiling tile off-cuts recycled prior to the show between July 11 and 17 while 12,884m2 (87.3%) was from tiles dismantled after the show, all in all saving contractors (whom Armstrong does not charge for the service) more than £10,000 in landfill and skip hire tax. In terms of environmental impact, as well as the 14,769m2 diverted from landfill, this year’s scheme saved more than 73 tonnes of virgin raw material, more than 20,000 kWh energy, more than 36,000 CO2 equivalent greenhouse gasses, and more than 251,000 litres of potable water. 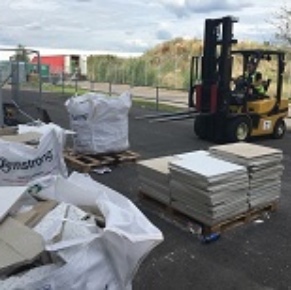 The tiles for recycling (Dune Supreme and Fine Fissured) were collected in bags and stored in the exhibition hall then returned on nine trucks to Armstrong’s production facility in Gateshead for recycling back into the mix with the help of logistics company and fork lift operators Ceva Showfreight, specialist waste management and cleaning contractors Sagum Events and the Southampton branch of specialist distributor SIG Interiors. Armstrong was first brought in to recycle its suspended ceilings at the 2008 airshow by the event’s largest independent chalet fitting contractor SDD I GES and back then saved 2,600m2 (or 10 tonnes) from landfill. The ceiling tiles recycled from this year’s Farnborough airshow help to bring the total amount of recycling by Armstrong since 2009 to more than 500,000m2. Armstrong pioneered ceiling recycling in the UK in 2003 and since then the programme has evolved to include all mineral tiles, no minimum quantities, a growing network of “Green Omega” installers and partnerships with national distributors to further support customers’ local recycling requirements.